With the end of Season 5, it seems that the ban waves have stopped as well, unless Blizzard is going to start targeting non-season players as well. It was speculated somewhere that the past 5 sets of ban waves have hit about 48.000 accounts, however, that number hasn’t been officially confirmed. 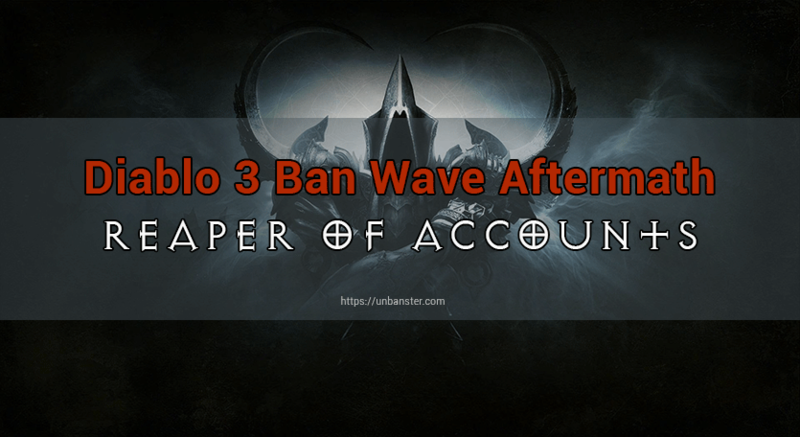 We’ve decided to make a Diablo 3 ban wave aftermath as a follow up post to the initial post to provide you with as much information as we can. If you’d like to read about how the ban waves affected the leaderboards and various other statistics, you can do so here, here, here, here and here. It’s a good thing to see Blizzard still caring about Diablo 3, even though they moved what was probably the best developer, namely John Yang, from Diablo 3 to World of Warcraft. I’ve personally enjoyed the game a lot more with him as a developer as opposed to before, but hopefully his replacement will be just as good, and I really hope to see John Yang back once he’s finished with designing legendaries for WoW. Regarding the ban wave, I’m sure a lot of players enjoyed the leaderboard boost, myself included, however, in some cases, I think permanent bans were a bit too harsh, but that’s up to Blizzard to decide. I really hope everyone will come back to Diablo 3 for next season so we can all play and compete, legitimately this time! Should you require our help, please don’t hesitate to check out our Diablo 3 unban service! Need help with a Diablo 3 account ban? We're here to give you the best help in order to get your Diablo 3 account unbanned! Get unbanned from Diablo 3!